Students in grades 8 through 10 can experience first hand, in the lab and on the sea, the latest in ocean science research and technology. 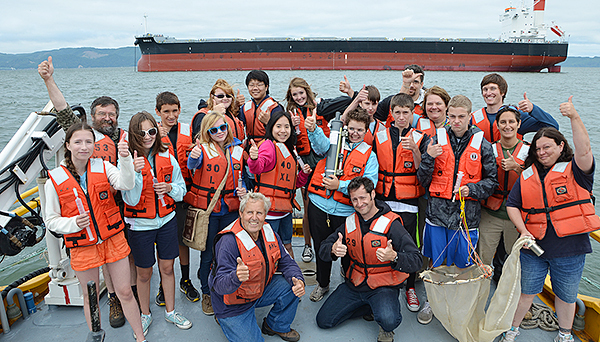 Join research scientists for a day on the Columbia River estuary to investigate the impact of chemical changes in the ocean environment. Learn scientific sampling and filtering procedures as you collect water samples, both aboard a scientific research vessel and on shore. In the lab, perform chemical analysis of the samples and extract DNA and RNA to identify the microorganisms present. Then assess levels of chlorophyll, phytoplankton, and nutrients in the water. Discover how mercury in our environment enters the aquatic food chain and poses a health risk to those who consume fish. Learn about the ocean observing platforms within the Columbia Estuary, what data is collected, and how the data may be used by researchers. Study the fundamentals of computer modeling and examine visualizations of the data. CMOP and Saturday Academy have partnered to offer this camp located at OHSU’s Walker Road Campus.